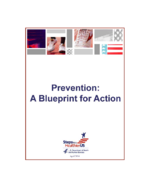 This report provides an overview of prevention efforts under the Steps to a HealthierUS initiative. First, it highlights the problems and challenges in preventing chronic disease. Then, based on a series of roundtable discussions between the Secretary and various interested stakeholders, it delineates specific action steps that individuals, communities, insurers, employers, healthcare providers, and other public and private entities can take. Finally, it profiles HHS activities that address these challenges, reports on progress and accomplishments, and identifies opportunities for additional action. This Blueprint for Action will create a template for collaborative efforts to improve the health and well-being of all Americans.